NEWS! - I have created a new web site for Mavers of all families, all over the world. From now on, information about the Maver surname in general will be at the new web site located at www.maverfamily.com. This web site will continue to have my own family history. The Surnames of Scotland states that the surname Maver is derived from the Gaelic maor meaning "a subordinate officer in various capacities, a steward." This Gaelic word is also the root of the English 'mayor' which is essentially a modern description of the office that the word originally stood for in ancient Scotland. The Surnames of Scotland also indicates that the surname originates in Speyside. Our roots, however, seem to be based in the south of Scotland, especially in Renfrewshire, though I expect to find a link to the Aberdeenshire area at some point in the distant past as that is where the majority of Mavers seem to come from. Traditionally, Mavers have belonged to the Clan Gordon, a very large and powerful clan in its day. However, the Mavers historically also have ties to Clan Inness and I have yet to find evidence linking our lineage to any specific clan. It is important to remember though that I have traced our lineage only as far back as the 1760's, a time when the Clan system had been weakened by years of oppressive English rule and many Highland practices --such as belonging to a clan, wearing a kilt, or playing the bagpipes-- were against the English laws. Burke's General Armory lists the Maver arms as "Argent three bars voided sable, over all a lion rampant gules. Crest - On a rock an eagle standing proper." I have yet to find out whom these arms actually belong to though. The Scottish heraldic laws are very strict and they treat arms as a material possession; that is, they can only be owned and used by one person at a time. This means that it would be illegal for anyone to use these arms without proof that they are the rightful heir to these arms. The Maver surname has been the most rewarding for me to research because of the challenges that it holds. 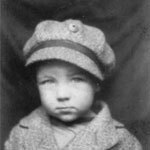 When I first began my genealogical research, I had very little information on the Maver side of my family; all I knew was that my great grandfather Albert's dad came to America from Scotland to work in the new Clark's Thread Mill. I didn't even know his name. From that scant bit of knowledge, I have been able to trace this Maver lineage all the way back to individuals born in the 1760's. Researching this surname is sometimes easy because the name itself is very uncommon but at the same time, the uncommonness of the surname often leads people to transcribe the name incorrectly, making some records difficult to find; I have seen the name written as Mavor, Mever, Mayor, and Navor and that is only when the name is not mistaken for something else entirely. I am very proud of all of the information that I have found and I look forward to continuing my research on this family. 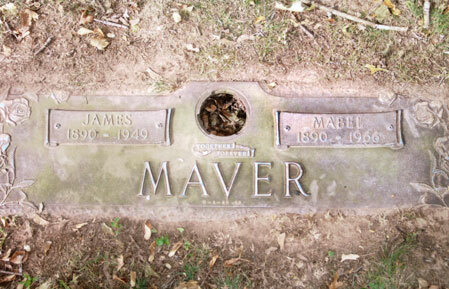 Please e-mail me if you have any information on the Maver's that you would like to share. I have only been able to find information on Archibald and William who both followed in their father's footsteps and became shawl weavers. Archibald married Judith Flynn in 1830 though it looks like she passed away shortly after they were married because Archibald was married to Helen Kirkland in 1833. I don't think that Archibald ever had any kids. He and Helen lived on Thread Street in Paisley for the rest of their lives. 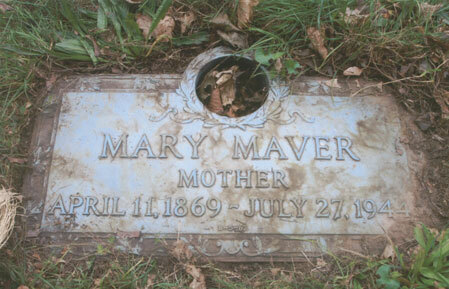 Little else is known about William and Catherine Maver except that Catherine passed away on December 10, 1861 and that she was a widow at the time of her death. It is also clear that Archibald and Helen Maver stayed in fairly close contact with William and Catherine as Archibald is the signatory on Catherine's death record. Elisabeth married James Clark on June 29, 1844. They had two daughters, Catherine and Mary. I have not been able to find any information on John or Agnes besides their birth records. I have not been able to find out what the family did immediately after James' death. By 1881 though, William is living in the Gorbals district in Glasgow and working as a slater, Thomas is living with his grandparents - Thomas and Elizabeth Marshall - in Leith, and Mary is living by herself in Edinburgh where she is working as a feather cleaner. I can not find John anywhere in the 1881 census. My guess though is that he was living with relatives on the Maver side of the family. At some point, John left his family and moved to Glasgow to join his older brother William and become a slater. On November 26, 1888 John married Mary Gillies, and the young couple lived in Mary's mother Anne's house. John and Mary had their first son, James, on May 7, 1890. By that time John had worked his way up to becoming a foreman twister at Clark's Thread Mill. By this time, John's brother William was married to Elizabeth Watt and they were living in Newton-Mearn's, Glasgow with their kids Mary, Elizabeth, and James. In the 1891 census, Thomas is listed as being in a hospital in Edinburgh though his ailment is not given. Their mother Mary is also living in Edinburgh and working as a Feather Dresser at this time. She lives in her house at 260 Cannongate Rd. where she would stay until her death on October 3, 1920. John spent a lot of his free time playing horn and leading the John B. Maver Orchestra. He would later contract Tuberculosis and blame it on his years of playing the horn. Thereafter, he would let his children play any instrument they wanted to as long as it was not a horn. His daughter Anne would join him in working in the thread mill when she had finished school and his son James followed in his footsteps by playing in his own band later on. John passed away on Sept. 10, 1912. Mary passed away on July 31, 1944 (view her grave). 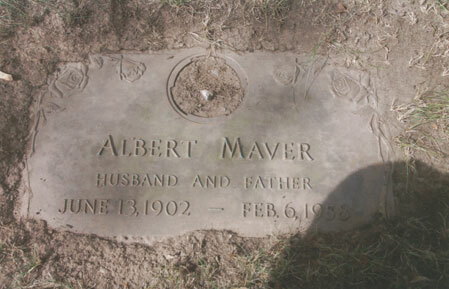 Albert died of cancer on Feb. 6, 1958 (view his grave). His wife Madge continued to live in Newark, New Jersey for a few years before moving to a house next door to her daughter Mary in Point Pleasant. Eventually she retired to Port St. Lucie in Florida. Madge passed away on April 27, 1992. 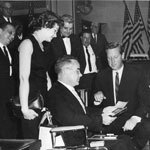 William Maver receiving the Medal of Honor in Newark, 1966. Read more about the robbery. 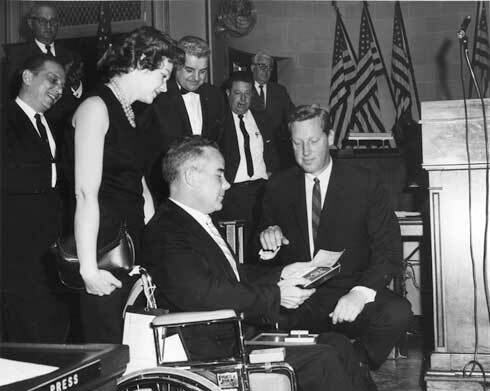 On December 16, 1965, William was shot in the back during a bank robbery (read the New York Times article). This left him paralyzed from the waist down for the rest of his life. He continued to work for the police force however; he drove to work every day and used crutches to get around despite the great pain it sometimes caused him. William retired from the police force in 1985. William passed away on November 27, 1989 (view his obituary). Williams's older brother Albert never married. He lived in New Jersey for most of his life and retired near his mother Madge's house in Port St. Lucie, Florida. He passed away on April 16, 1999. Mary married William Lodato and had four kids: William, Joan, Douglas and Janine. She now lives with her daughter in New Jersey. Ronald married Dorothy Martin and had four kids: Ronald, James, Debra and John. He now lives in Florida. Alan later married Barbara and they now live in North Carolina.